Are you looking for GSD female puppy names? Here are a few suggestions to check out for that new female dog in your life. Consider choosing from any of the many GSD puppy names below. Important Note: Naming your puppy is the easy part of owning a GSD. 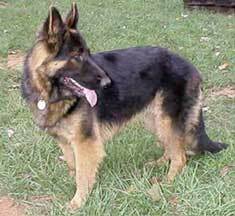 If raised incorrectly German Shepherds can become aggressive, anti social, out of control or unmanageable. 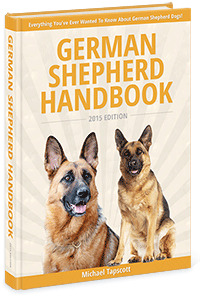 I highly recommend reading The German Shepherd Handbook which will teach you everything you need to know about raising the happiest healthiest GSD possible. For some people, picking out the perfect name for their new Alsatian dog is very easy process. Other people, however, need a lot more assistance in choosing the perfect female puppy name. Do they name their dog after a family member, a cartoon character, a favorite movie star, a historical figure of some kind? How about a favorite place to vacation, a city you'd like to visit, the street you live on, a best friend or teacher? Hmmmmm? Have fun researching the female dog and female puppy names below as potential candidates for your new GSD girl puppy! Now that you have a few ideas in mind for choosing those great female puppy names, and know how to choose a great name for your female GSD, just what name should you choose? If you are in the market for ideas for German Shepherd female puppy names, then start by looking at the female puppy names listed below. If you need a male German Shepherds name or you are looking for a unisex dog name you can find some suggestions on those pages. You'll be using it often - during dog training, when calling them to you, when at home or at play, etc. Choose your name thoughtfully. Hopefully your female puppy will have it the rest of her life. Good luck finding the perfect name for your new female puppy. The female name choices to choose from are endless - let your imagination help you. However, following these simple tips and using some imagination, you will soon find the perfect female puppy name for your new German Shepherd! Remember, too, once you find that perfect female puppy name to get it put on a dog name tag (attached to the GSD female puppy collar along with your name and phone number as soon as possible. Better safe than sorry with your new female GSD puppy.